Originally called cenote Esceleto, then renamed during exploration for the Temple of Doom. There are incredibly beautiful limestone formations shaped by year by the aggressive salt water, also many fossils that can be found inside and outside the cave. 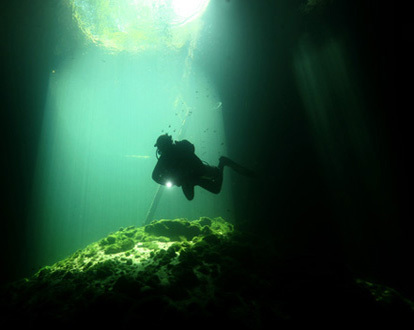 After a brave jump and quite murky entrance you get to the cavern line and start swimming into the circuit. You will pass through many layers of halocline which is where the salt water meets the fresh water and does not mix because of the different density, instead creating a dense layer, a very cool liquid effect! The halocline also makes weird mirror-like effects giving you a feeling like being on the other side of the mirror, just like Alice in Wonderland. Everything is in slow motion. If you only have got one day for cavern diving here visit this place. Unforgettable experience!